We had a bit of Ankhy Panky at our Christmas Party. Barry Goldring was to blame. We had our usual Four Tables dowsing contest, and Barry’s table, witily titled ‘Ankhy Panky’ was based on the Egyptian symbol of the Ankh, a cross with a looped top. Barry asked us to dowse what the ankh was for, what it was made of and how big it usually was. Since you can only ask your rods or pendulum questions phrased to get a Yes or No answer, this took a while. And none of us got it right. Barry admitted that although you see the Ankh symbol all over the place in Egyptian literature (notably on Tutankhamun’s cypher where the symbol is used as part of his name, as in Tut - ankh - amun), nobody is entirely certain what it means. However, Barry had dowsed earlier, and after a lengthy session, he had come up with the suggestion that it may have been some sort of magnifying glass - without the glass - in order to focus healing or attention. We all agreed it was probably between 8 to 10 inches in length, cheating a bit because it looks that size in Egyptian pictures. We had no idea what it was made of, but Barry’s rods indicated gold, copper, lead or aluminium. The Egyptians would have had the first three, but not the latter. The really interesting thing was that each metal has the same molecular composition. At the other three tables we had to dowse how many words there were in four different dowsing books; pictures in envelopes and, more traditionally, three bottles of water - which was Scottish spring, which was Dursley spring, and which was tap water? 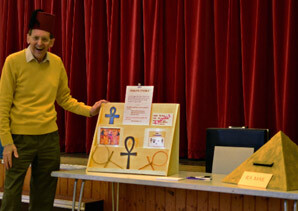 Barry Goldring displays the ankh, an Egyptian symbol, for Slimbridge dowsers to dowse at their Christmas party. Photo Patrick Callaghan. None of us did very well, even our more experienced dowsers. It seems dowsing in a group is rarely successful, partly because group energy can intervene, and partly because there is an element of competition involved, which can confuse matters. Dowsing is probably best done alone, or with just one or two others seeking the same answers, but even dowsers are allowed a little Ankhy Panky at Christmas.